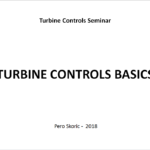 Turbomehanika successfully retrofitted the controls for two identical steam turbine trains that are parts of the Old Nitric Acid plant in Petrokemija Kutina. The trains are manufactured by Escher Wyss and commissioned back in 1968. Operating continuously since. 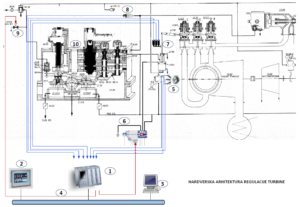 Each train consists of a steam turbine, two process compressors and a gas expander all coupled together. The steam turbine being the main drive with the expander supplementing it by expanding the process product gasses through. 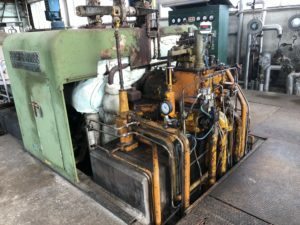 The scope of the retrofit was to replace the existing steam turbine control and the compressors antisurge protection with a new PLC based Integrated Turbine Compressor Controls (ITCC) system. Siemens SIMATIC S7-1500 PLC together with Bently Nevada Adapt 3701/55 ESD are used as the PLC hardware. Turbomehanika have been the main contractor for the job with Arirang and Intea being subcontractors. 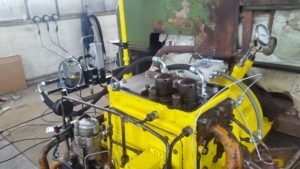 The old control system consisted of hydraulic turbine controls and compressor antisurge protection. They were both using the same 7barg hydraulic/lube oil system. 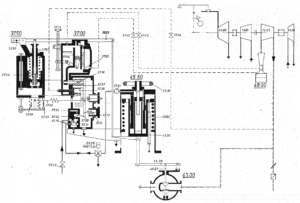 Steam Turbine Controls had a flywheel isochronous governor operating three steam control valves actuated by a linear hydraulic servomotor. The governor and the trip unit were both integrated together at the steam turbine front pedestrian. The project spec required to use the existing trip device. Separating one from each other was quite a challenging task that required gaining a deep knowledge of the Escher Wyss control concept. The governor was cut out while the trip device and the servomotor remained a part of the current system. 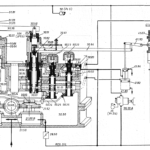 Compressor Antisurge System had a control unit and the blow-off valve operated by a hydraulic servomotor. The control unit was cut out while the blow-off valve with its servomotor remained parts of the current ITCC. All through the recent years the customer were keep experiencing issues with the antisurge controls. 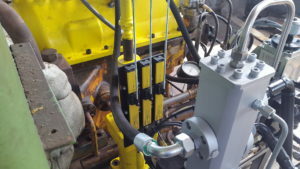 It would open the blow-off valve when it was not supposed to causing costly plant shutdowns. While commissioning the new controls we found that in some operating modes compressors are expected to run quite near to the surge region. The old antisurge controls were most probably not being able to deal with that operating situation. To enhance the unit safety S7-1500 PLC and Adapt 3701/55 ESD are integrated together, either able to trip the unit in a case of the specified process emergencies. They also monitor each other for a continuous code execution. 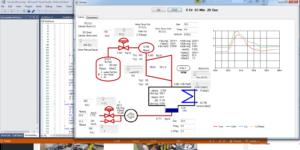 The control algorithm is executed by S7-1500 PLC doing both the turbine control as well as the compressor antisurge. The train rotating speed is measured by six probes. Three are used by S7-1500 PLC and the other three by Adapt 3701/55 ESD. The unit continues to operate in a case one of the each probes failed. The unit is safely tripped out in a case of two out of three probes went bad. Both the steam control valves servomotor and the blow-off valve servomotor are commanded through a Voith I/H converter each. The turbine control valves servomotor is fitted with three LVDTs providing a reliable position feedback. The unit is safely tripped out in a case of two out of three LVDTs failed. The blow-off valve position is measured by a single LVDT. In a case the LVDT fails the blow-off valve is tripped open. The unit can be operated either through a touch-pad control panel or a PC based HMI. The control panel is located in the field at the unit itself while the HMI is in the control room. The HMI is also used as an engineering station. All the control hardware for both trains are fitted together in a single electrical cabinet that is located in the common control room. The control software consists of the train/turbine speed control and the compressor antisurge protection/control both integrated together. VPI loop with enchanted dynamic. Used for both the speed control and the antisurge protection. By default the VPI loop reacts to process value rate of change. Our design enhances that characteristic further. When used for antisurge control this feature can open the blow-off valve even if the compressor operating point is far out of the surge region. The VPI opens the blow-off valve as soon it senses the compressor operating point is rapidly moving towards the surge region. This compensates for a blow-off valve slow response that is a common problem with antisurge controls. Semi-PI loop. 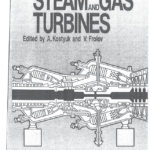 Used to drive both the turbine steam control valves servomotor as well as the blow-off valve servomotor. This PI loop switches its integrator off if the feedback is close enough to the command. By that means I is out of the count as far the stability is concerned hence using only the I good features. 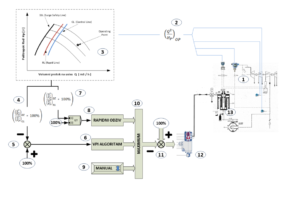 This loop proved particularly useful with the steam control valve actuation where Voith I/H is actuating the servomotor directly against variable steam pressure forces. When applied to the blow-off valve it made it much faster reducing its initial hysteresis that was about 10% to less than 1% at the end. 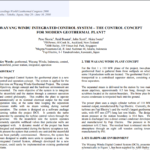 This project was characterized by a very short time allowed for the field commissioning. The customer expected the units to be fully operational at the end of the second day after the live steam was made available. All the field testing and tuning required were supposed to be done in two days. To meet the field commissioning deadlines some extensive precommissioning was to be done. 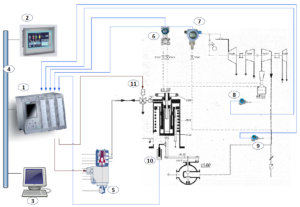 The process simulator used here is our own designed C# modular software package that emulates turbine relevant power processes at a high fidelity level. It can be customized to resemble almost any steam/gas/water/wind turbine application. 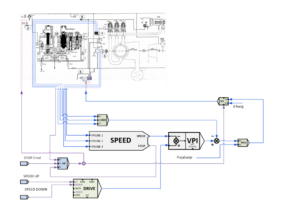 During the software design phase the simulator directly communicates to the PLC emulator creating a real world closed loop experience. The simulator enabled us to pretune the controls to a level that only some minor tuning were needed during the filed commissioning. All the control loops were found quite near their real world optimal tuning. The simulator is also used for the software FAT as well as for operators training. 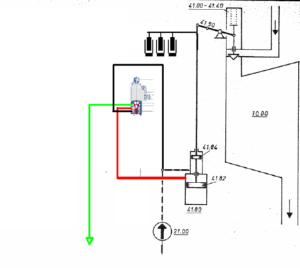 The actuation line consists of the Voith E/H, the pilot valve and the servomotor. 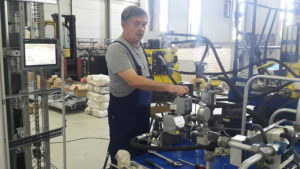 The whole line together with the trip device was provisionally set up at the hydraulic test bed in the Turbomehanika workshop. It was thoroughly tested and tuned. However, during the field commissioning we confronted an issue of the oil system being heavily contaminated. 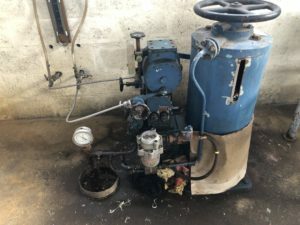 Although the Voilt E/H and our designed pilot valve are known as relatively resilient as far oil contamination we experienced some issues related to it. Ended up installing an additional filter ahead of the Voith E/H. After the control software and actuation line precommissioning done the field commissioning went relatively smoothly meeting the given time schedule.